Manufacturer of a wide range of products which include usb to serial converter. 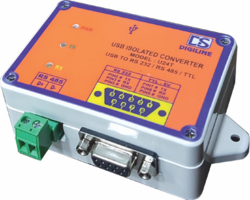 Digiline USB to serial converters offer high-performance, industrial-grade connections for your PC with serial devices over a single USB port. A wide range of USB to Serial converter models are available. USB to serial converters are ideal for direct serial connections to industrial devices with the latest PCs and laptops.